(NASA), and the Japan Aerospace Exploration Agency (JAXA). meeting will help us prepare for the next big event." importance: storms from the sun. countries are where the gaps are, particularly at low latitudes around Earth's magnetic equator. around the magnetic equator. 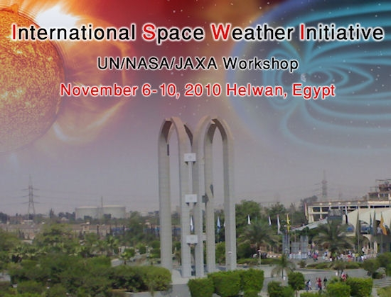 This could lead to a revolution in studies of low-latitude space weather. auroras. There’s a phenomenon for every latitude and level of expertise. spots around the world. The next meeting will be held in Nigeria in November 2011.
most out of the way places are often where data are needed most. Everyone is invited." learn more about available projects and how to become involved. x-ray solar flares in years, an M5.4-class eruption at 15:36 UT on Nov. 6th. Click on the image to view a movie of the blast from NASA's Solar Dynamics Observatory. Nov. 6th, sunspot 1121 took Sunday off. No strong flares were recorded for the rest of the weekend. Nevertheless, the active region's magnetic field is complex and harbors energy for more eruptions. 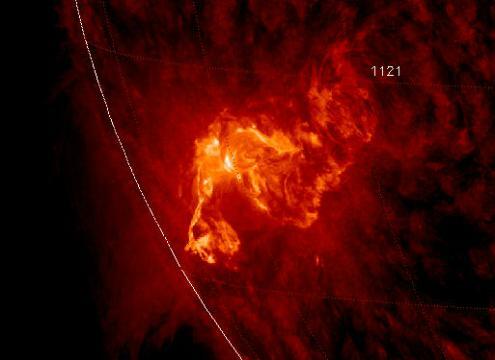 NOAA forecasters estimate an 85% chance of M-flares during the next 24 hours.